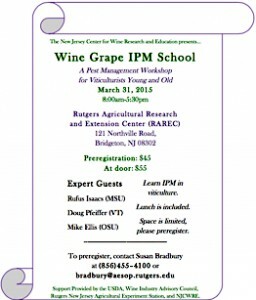 Rutgers University and the NJ Center for Wine Research and Education will be hosting a “Grape IPM School” on March 31st in Bridgeton, NJ. Experts from Michigan, Virginia and Ohio will be joining Rutgers to share their knowledge about key insect pests, diseases and weed identification. This workshop is aimed at growers of all experience levels. Space is limited. See attached flyer for details.